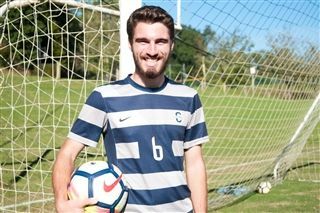 Robert Wood, a senior at Covenant, was recently honored by CBS19 by being named Student-Athlete of the Week. However, what makes Robert stand out isn’t just his athletic ability and his membership on the Covenant soccer and tennis teams. He is an excellent student and was recently the lead in Covenant’s spring musical, Footloose. His character, skills, talents, and work ethic, and his commitment to being a well-rounded student are exactly what every teacher, parent, and administrator hopes a Covenant student becomes. Read more about this and watch the video spotlight on CBS19’s website.